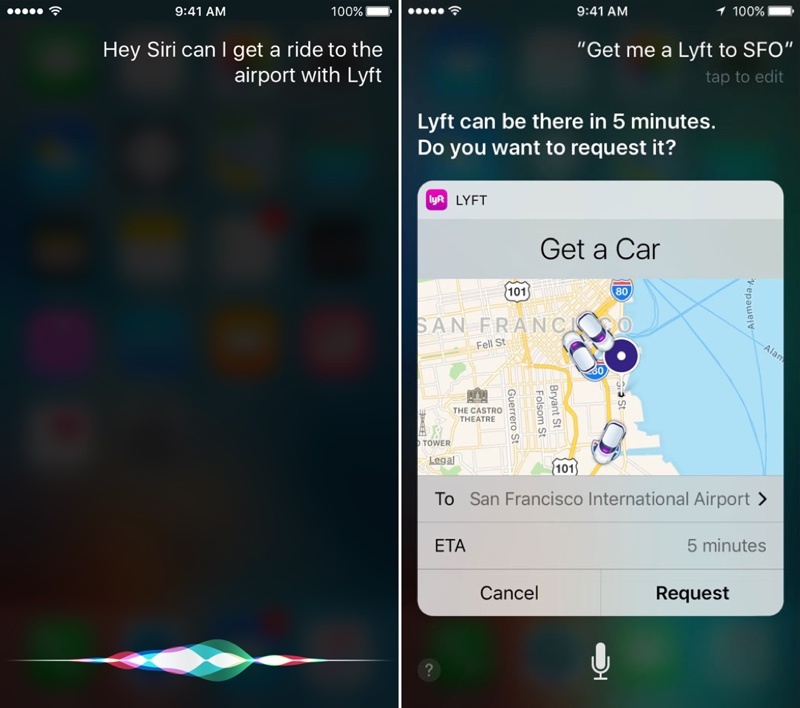 iOS 10 lets Siri work with third-party apps for the first time, enabling a whole range of features the personal assistant is able to help with, from summoning an Uber to sending cash to sending a message via WhatsApp. Ahead of the launch of the new operating system update, The Wall Street Journal's Nathan Olivarez-Giles was able to go hands-on with some of the apps that will support Siri and give a little more insight into how the feature will work in practice. After using the feature, Giles called Siri support for third-party apps "long-overdue" and a factor "important to making Siri more useful in everyday life." He was able to test apps for sending mobile payments, image search and messaging, but Siri will also support ride booking apps like Uber, VoIP calling apps like Skype, and workout apps. Giles says asking Siri to perform tasks was "quicker than launching the app" and carrying out the task himself. As has been previously described by Apple, Siri commands like "Siri, send Catherine $20 for lunch with Square Cash" or "Send Jim a Message in LinkedIn" work in iOS 10, and with the former, security is maintained with Touch ID authentication. Commands vary from app to app and Siri support can also be built into watchOS 3 apps. Strings can get even more specific. For instance: "Siri, show me photos of what Kanye West wore to the VMA awards this year in Looklive." This command pulled up pictures of the rapper's wardrobe, along with links to buy what he was wearing, in the celebrity shopping app. In most of these demos, Siri carried out the task without opening the app itself. Instead, a card, styled like the app, appeared with the details of the action. According to Giles, some of the first apps to integrate with Siri in the chat, mobile payments, and photos categories will include LinkedIn, WhatsApp, WeChat, Slack, Square Cash, Monzo, Pinterest, Vogue Runway, Looklive, The Roll and Pikazo. Apple has previously said apps like Lyft, Uber, and Fandango will be compatible with Siri, along with CarPlay-specific apps. Not all apps will work with Siri, but Apple has plans to expand the app types that can interface with the personal assistant in the future. When iOS 10 launches, the following app categories will have the option to enable Siri support: ride booking, messaging, photo search, payments, VoIP calling, and workouts. Apple has limited SiriKit to certain kinds of apps in order to keep a tight rein on privacy, control the Siri experience, and develop Siri's understanding of language and context. Apple has promised that third-party apps are only privy to the specific data necessary to perform a requested function, keeping user information locked down. Siri support for third-party apps is baked into iOS 10 and will be available as soon as the new operating system launches to the public in September. Apps will need to update to support the new feature, but many companies are undoubtedly planning launch day updates to be among the first to work with Siri. Siri is still crap is iOS 10. Really..... What took them so long? It might be that they have people already called Jackson in their address book. Hold up, I'll test. EDIT: Yep, that's the case. Google Now still doesn't have an open API of any kind. You don't need one. You use the Google Voice Interaction API for voice commands. If you advertise with Google, your restaurant logo (e.g.) will appear on Google Maps. If you don't, it doesn't, making the user think that your business doesn't even exist, because other similar business are marked on the map. Not true. Any business that doesn't show up... usually because it hasn't been verified as being a location open for consumer purchases... can enter its information in Google My Business ('https://www.google.com/business/') to show up for free. Sure, but it understood the name Michael Jackson properly; it's just looking in the wrong place. It's going to be a mess when other apps start integrating into Siri. I get the feeling this junk is only viable in the Bay Area. Seems like while some have issues with it others do not. Nah, it's just if you have a surname with 'Jackson' in your contact list, with a birthday added, it will always bring up the contact one; even if the name is different. You can test it out by adding a new contact with <any first name> & Jackson as the surname, then add a fake birthday, and it'll happen each time when you ask Siri. Siri, send 14 billion dollars to the EU. "I'm sorry, I didn't understand 'tax evasion'. Would you like me to search the web?" THAT is, IMO, the overarching issue with speech-driven AI. Context is everything! The ability to ask for something specific - a persons birthday - just to have the request generalized because of a partial match in the first place it looks is a critical mistake. I could understand this if there was a "Michael Jackson" or someone with a phonetically similar name in the address book. I could even understand if Siri responded "there are several matches for your request... did you mean ... " then verbally give me an option. Sadly, Siri does neither. It just gives up. I'm thrilled to have Siri coming to other apps and look forward to the day when it becomes smarter, but agree that we're going to have major issues of context. After using the feature, Giles called Siri support for third-party apps "long-overdue" and a factor "important to making Siri more useful in everyday life." That is something I think we all could agree on. With Google Now, everything is controlled by Alphabet, Inc. Isn't an API for Google Now and Google Maps (and Google Allo while we are at it), also long overdue? Slowpoke media like WSJ should leave tech coverage and analysis to those who know what they are talking about. Google Now has API and apps can be called / used / searched directly via voice in google now. It works much better with google services, but many other Apps have started to take advantage.